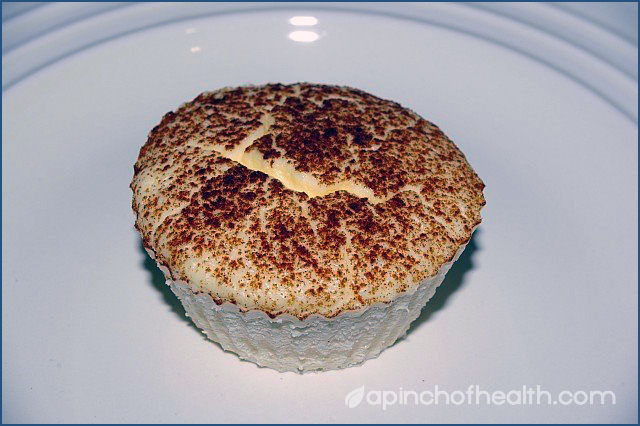 Very yummy low-carb cream cheese muffins / cheesecake which are proving to be quite popular with our members. Just over 2 carbs and under 200 cals each, enjoy! I found an old low carb cream cheese muffin recipe on LCF and made up a batch. I usually hate baked cheesecakes but these were yummy! I had some problems but I did add some cream so that may have been why, next time I won't. Our philly blocks are a little bigger then theirs but I just used two of our blocks anyway or buy 2 x 250g tubs of home brand cream cheese, which is cheaper. The problem I had, was the tops cracked before they were finished cooking, so I turned my oven off a couple of minutes early - which is what others had been recommending but only to find later the bottoms were still a bit moist. These also sunk afterwards, despite cooling them slowly. Next time, I will cook longer at a lower heat and I will make a biscuit base. 350 is about 180 celcius, see here: measurements and conversions. Their cup size is a touch smaller then ours by about 15ml but I figure that wont matter much! I should mention everyone recommends waiting until the next day before eating them because they're even better straight out of the fridge, just verified that it is true!!! Pour into 12 lined muffin pans and sprinkle cinnamon over the top. I cook them in a 150-160C oven for 20 mins and leave them to cool in there, no cracks or sinking. The post was edited 3 times, last by Sherrie: splenda ( Jan 16th 2017, 5:52pm ). Yum! Do you know the amount of carbs per serve? They were less then 2g each, I got 12 muffins. These are suprisingly good for something so basic, they are not big muffins but nice all the same. Just made a half batch of these as that's all the cream cheese I had...the batter tasted nice, they smell nice, I'll try them tomorrow. Oops...they didn't last the night! Did you eat them all??? Naughty girl, I take it you liked them then! They are pretty good for something so simple and plain! Do you think you could freeze these??? I have never tried but I have had no problem freezing unbaked cheesecake. Try freezing one first and see. Oh and before I used to freeze my cheesecake I would wrap it tightly in glad wrap and then wrap in alfoil. I froze mine. I put 2 in a sandwhich bag, they came out fine. Ok I have a question for these as a variety, to use less sugar, can anyone who is a good cook let me know if they think it will work? If not I will try them and let you know. what would you reckon if I substituted some sugar with some Lindt 85% chocolate and some cream. I have never tried them with sugar, just splenda. I use 1/2 cup plus I usually add an extra egg and some cream. It should, just won't be very sweet. I'm making a full batch of these today, hopefully they'll last longer than the last batch! I was wondering about "freezing" but my query has been answered. I thought I was going to have to play lady bountiful and pass them on to my friends, but no way, in the freezer they will go. Do you think they would work successfuly with cottage cheese? as a bter we could then have them as a protein snack "real food" ? From what I was reading when it comes to baked cheesecakes they really need the fat but you could give it a try, maybe just make half a batch just in case?